Mark your calendars for September 14, 2012 and join us for a Dinner Cruise on Lake Ontario, a networking event hosted by AREC in colaboration with RBNS and Femei de Succes. Great food, Great Music, Dance and lots of fun on a romantic 165′ three-masted gaff-rigged schooner, which can comfortably accommodate parties of up to 225 people. Croaziera pe lacul Ontario – Nu ratati ocazia unica de a va intalni cu zeci de profesionisti de origine romana! Networking profesional admirand Toronto la apus, de pe splendidul vas cu panze – Kajama! Launched as the Wilfred in Rendsburg, Germany in 1930, the KAJAMA traded under sail for nearly 70 years. She was a familiar ship in ports from Northwest Spain, through western Europe, and as far north as Norway and Russia. 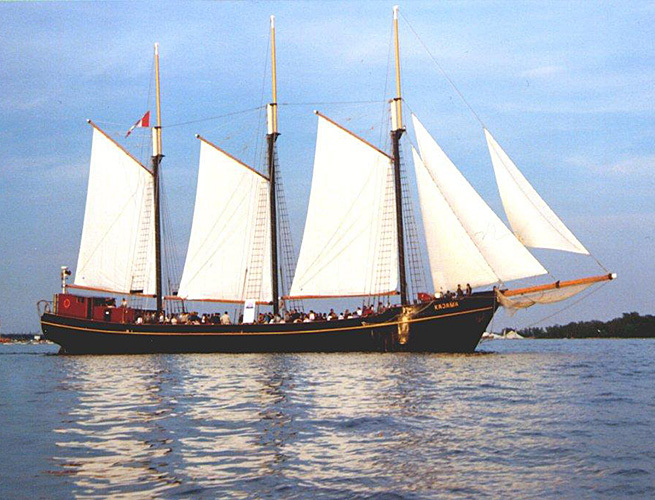 In 1999, KAJAMA was delivered transatlantic by Great Lakes Schooner Company and restored to her original profile.